[Jesus] noticed two empty boats at the water's edge, for the fishermen had left them and were washing their nets. Stepping into one of the boats, Jesus asked Simon, its owner, to push it out into the water. So he sat in the boat and taught the crowds from there. When he had finished speaking, he said to Simon, "Now go out where it is deeper, and let down your nets to catch some fish." "Master," Simon replied, "we worked hard all last night and didn't catch a thing. But if you say so, I'll let the nets down again." And this time their nets were so full of fish they began to tear! A shout for help brought their partners in the other boat, and soon both boats were filled with fish and on the verge of sinking. Simon (Peter) was a fisherman. Being a fisherman was his life. Being a fisherman was his trade. So when Jesus told him to fish in a certain place and at a certain time that Peter "knew" were wrong from all of his experience, he must have had to swallow hard to follow this carpenter's instructions. But, he did! He basically told Jesus, "If YOU say to do it, then I'll do it!" Let's be honest. There are times when what Jesus tells us to do seems at best counter-intuitive and sometimes crazy. Just a cursory reading of the Sermon on the Mount (Matthew 5-7) gives us more than enough to chew on for a lifetime. That's when our love for Jesus and our submission to his lordship really are tested. 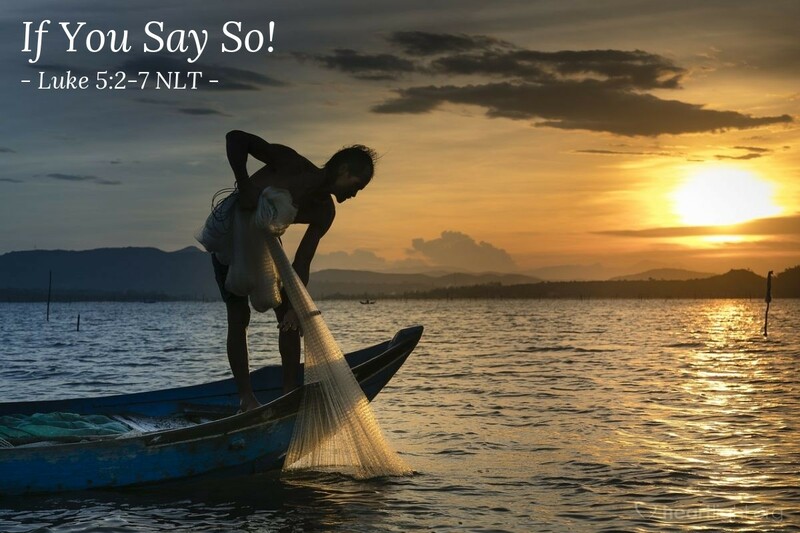 Are we willing to be like Peter and say, "Lord, if you say so, I'll do it!"? Give me a pliable heart and a willing spirit, O God, to obey what your Son has taught and to do what his lordship calls me to do. In Jesus' name, I pray. Amen.